Nathan Sports is sold in over 45 different countries and was on Inc.’s 500/5000 List of Fastest Growing Companies in 2013. They make hydration, visibility, and performance gear using industry leading materials. If you go to your local running store, there will most likely be Nathan products there. The Nathan Speedview is a water bottle that offers some great additional features. It has an 18 ounce SpeedDraw Flask with a Race Cap. 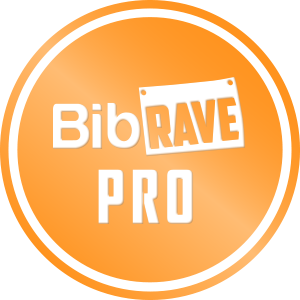 The Race Cap allows you to get quick bursts of water without having to open or close a valve. I love this feature and prefer it to open and close caps. The pocket has a see-thru conductive touchscreen that allows you to use your phone while it is in the pocket. There is a separated back area to the pocket where you can store money, keys, gels, or whatever else you want to take with you. I do have to say that if you have your phone, gels, keys, and a full water bottle, it might get a little heavy (not terrible though). The pocket also has an earbud hole for easy wire access. The back side of the Speedview has a loop that you can slide your hand in. The bottle and loop have an ergonomic design and the whole unit is extremely comfortable. There is even a cutout for your thumb. The loop tightens with a single pull of a cord and really makes the bottle seem like an extension of your hand. 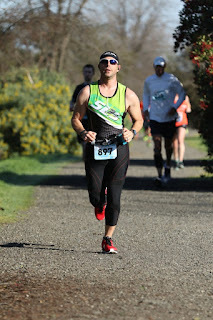 I always run with my phone and this is a great all-in-one option when you need to take water, your phone, and other gear with you. You can pick up the Speedview at Amazon for about $28.65 or at a local running store near you. 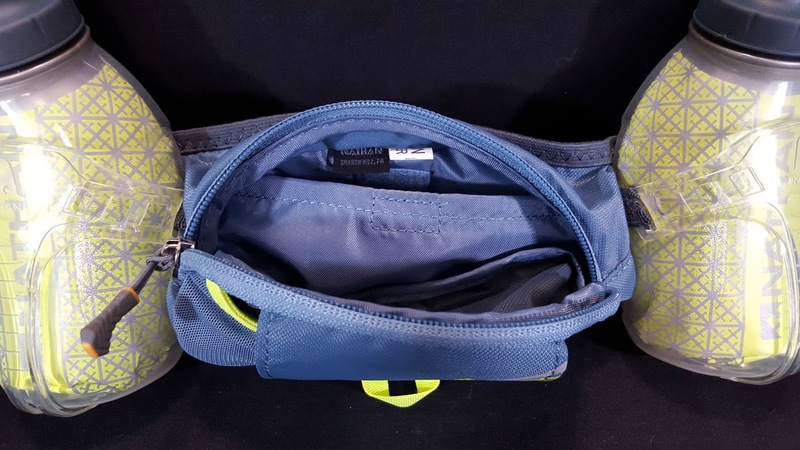 The Nathan Peak is a comfortable waist pack that is great for training runs or races. It comes with an 18 ounce ergonomical SpeedDraw flask (The same flask as the Speedview). The cap has a Push-Pull top that is easy to use and you can get plenty of water out of, unlike some bottles where you have to struggle to get a drink of water. The bottle slides into an angled bottle holder that is easy to use and lets you grab the water and put it away with one hand. The belt is comfortable and doesn’t bounce around or slide at all. There is a pocket that is perfect for smaller phones, gels, car keys, or whatever you need to bring with you. There is also an external shock cord system to hold your jacket or other gear when it’s not needed anymore. You can pick up the Peak at Amazon for about $31.15 or at a local running store near you. 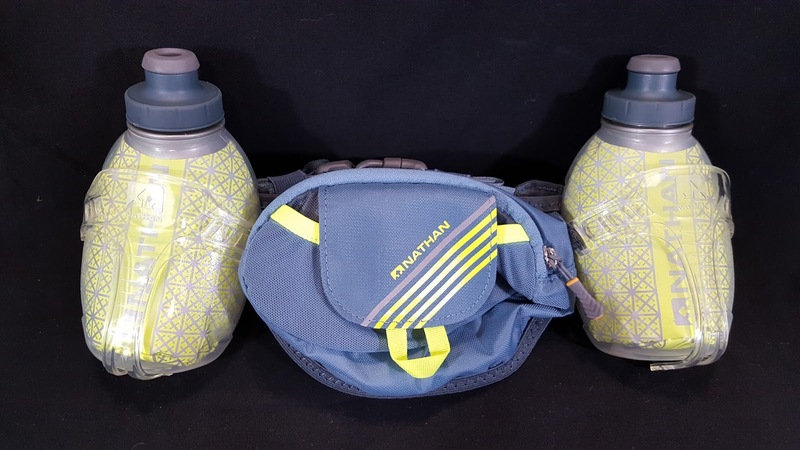 The Nathan Trail Mix Plus Insulated Hydration Belt is a great option, whether you are heading out for a run on the pavement or hitting the trail. 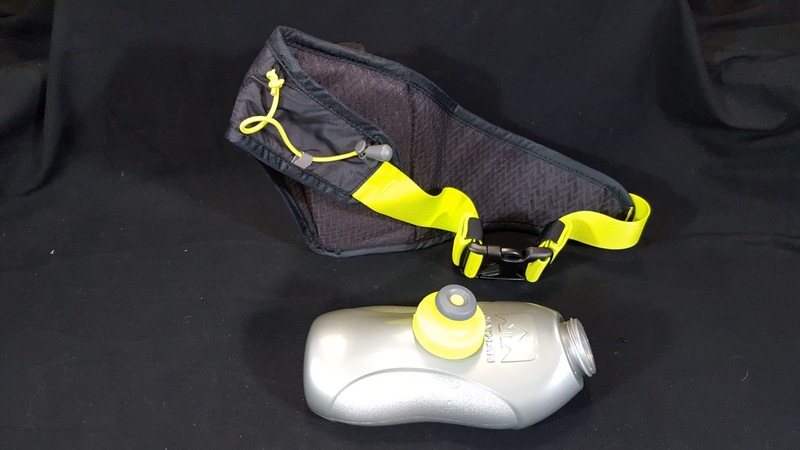 The Trail Mix Plus Insulated Hydration Belt features two 10 ounce Fire and Ice reflective and insulated flasks with Nathan’s Push-Pull caps. Not only will these bottles help keep your fluids cooler 20% longer than other insulated bottles, but the fire and ice technology offers 360-degree reflectivity for those early morning or late night runs. The ergonomically shaped belt offers a multi-directional stretch that eliminates bouncing. 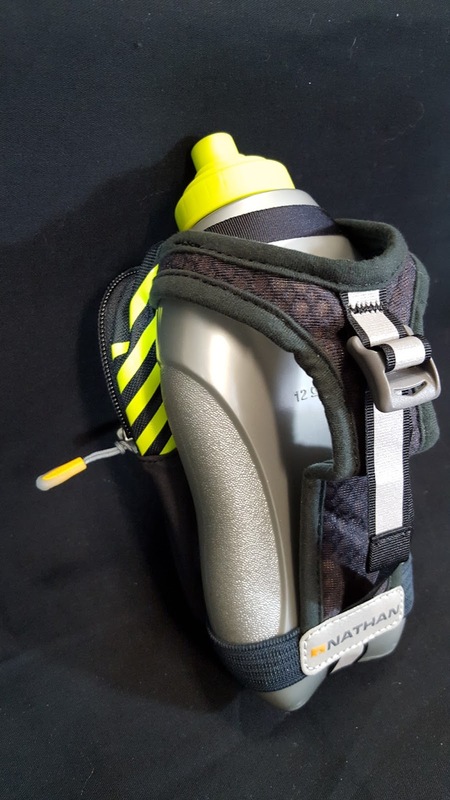 The Speed-fit holster makes it easy to store and retrieve your bottles. This pack has multiple pockets. The large zip pocket has a key ring clip and is big enough to easily hold a Samsung Galaxy S6 or other large smartphone (it says it will even fit a iPhone 6 Plus). There is also a smaller stash pocket for gels or other essentials. The elastic cord systems on either side of the Trail Mix Plus Insulated Hydration Belt are great for gels, a jacket, or other items. 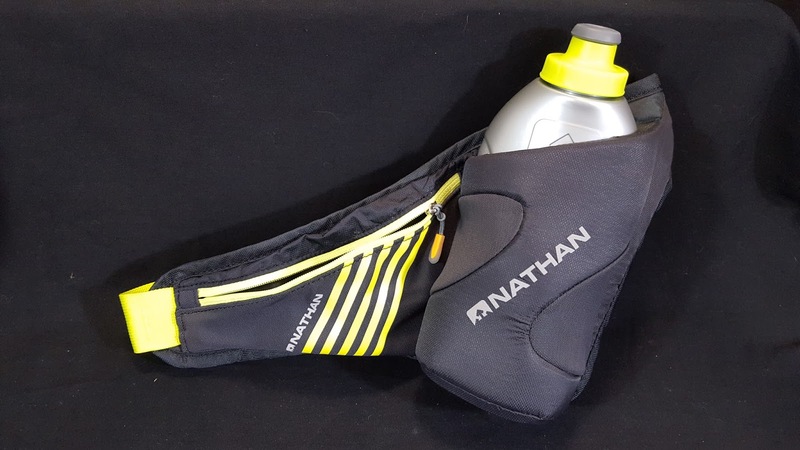 This is one great hydration belt from Nathan. I really like the insulated bottles and the fact that they are reflective. The back storage pockets hold tons of gear and the bottles are easy to grab and store in the holsters. 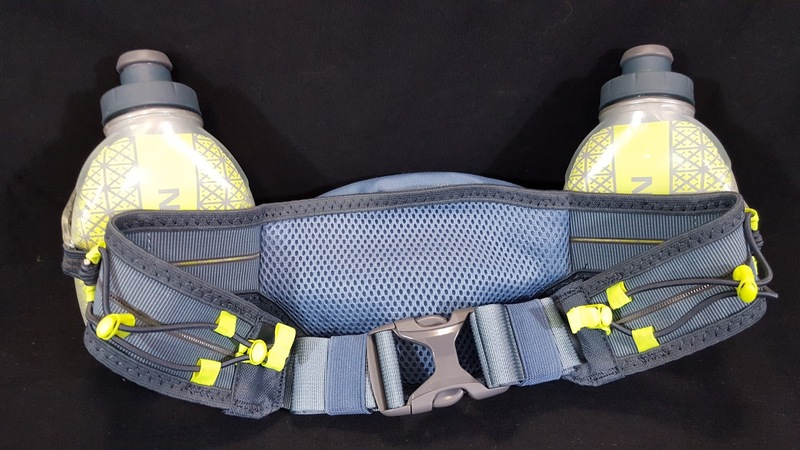 You can pick up the Trail Mix Plus Insulated Hydration Belt at Amazon for about $49.91 or at a local running store near you. Nathan sent me the VaporAir to test out back in September. 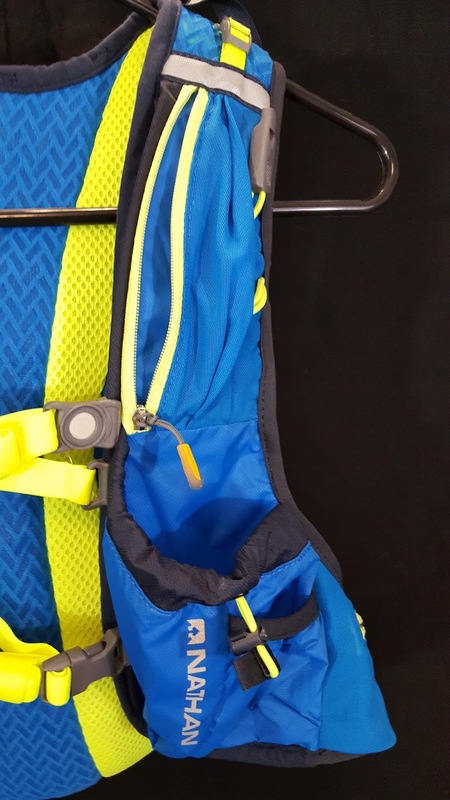 It is one of their higher end hydration packs, although the price isn’t too bad, starting at $115. This is a very light weight (weighing only 9.3 ounces) hydration pack that uses highly breathable materials for added comfort, even on your sweatiest runs. The hydration pack comes with a 2-liter bladder and detachable hose that makes it easy to clean. The bladder can be turned inside out for drying and has a sliding clip at the top of the bladder to keep it closed. The bite valve can be turned on and off by twisting it and you can get a decent amount of water without having to work too hard. The hose has a magnet which connects the hose to the front of the pack to keep the hose your of your way. It took a little while to get used to the hose not resting closer to my body, but wasn’t a problem after my first test run. 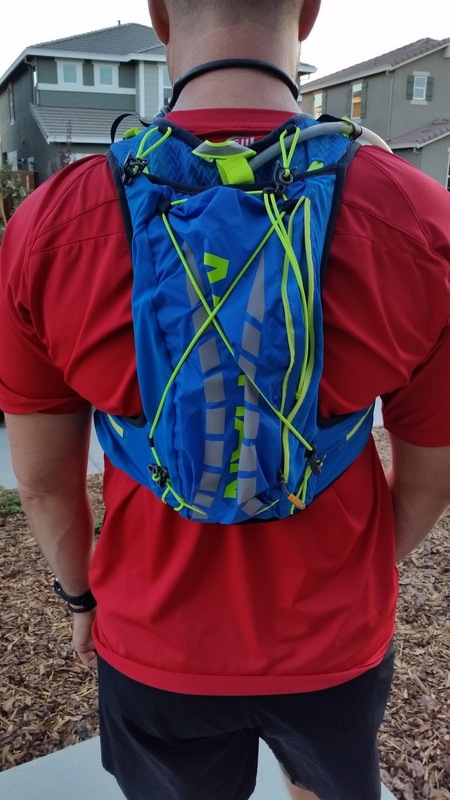 This pack has tons of storage for your runs, long or short. You have two pockets that fit water bottles in front (although I use one for my cell phone). There are two stash pockets for gels, and two more zippered pockets on each side of the pack, near your torso. There is a pill pocket that is water resistant for your salt pills, a zippered pocket on the front for your smartphone (not big enough for my Samsung Galaxy S6 with a case), and a huge pocket on the back of the pack. There are 9 pockets in all. Another feature of the VaporAir that I liked was the attached whistle. 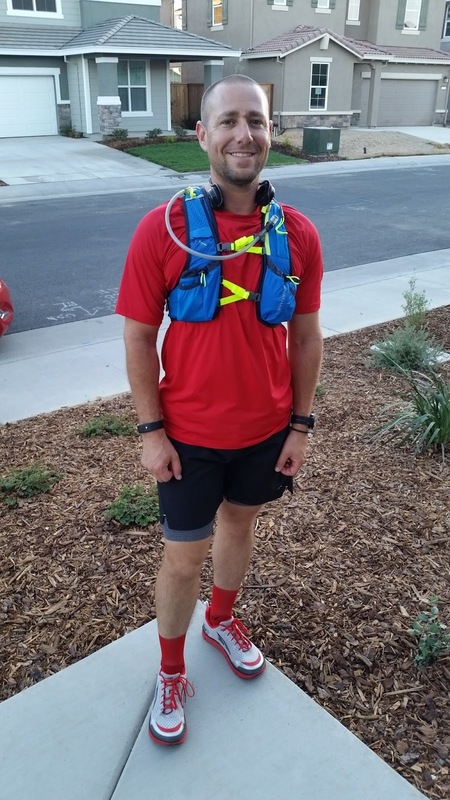 If you need to get someone’s attention, either for safety or because your running partner is getting way too far ahead of you, Nathan included this helpful tool for you. The soft touch edges on all perimeter bindings reduce the possibility of chaffing. There are reflective markings all over the bag and elastic cords to hold extra gear. There are even cables to attach trekking poles. I love the way this pack was designed. It sits a little higher (race style) than some of the hydration packs out there. 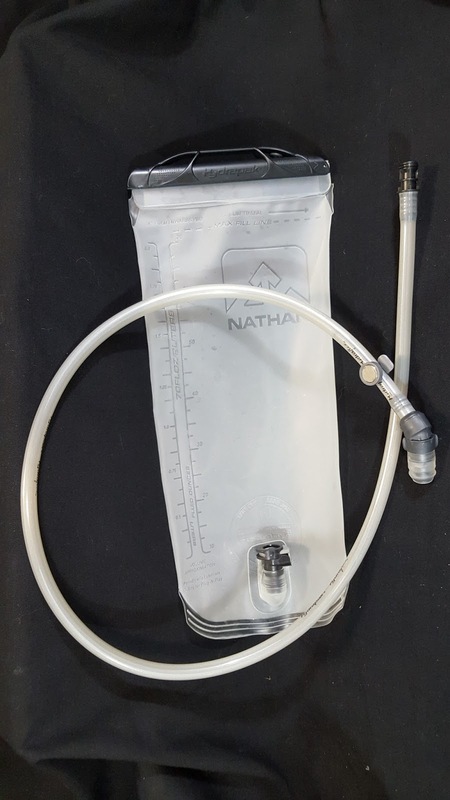 Nathan used contour mapping to design the pack so it does not bounce around and there are load lifters to pull the water and gear closer to you after you have less water in the bladder. The pack really does feel like an extension of your body. I was unsure about the VaporAir after my first run because the hydration hose sticks out a little more than what I am used to. After that first run, that wasn’t an issue. This is a great hydration pack. It is super light, has tons of storage, and does not bounce around when you run. You can pick up a VaporAir starting at $115 at Amazon or at your local retailer (click here for locations). 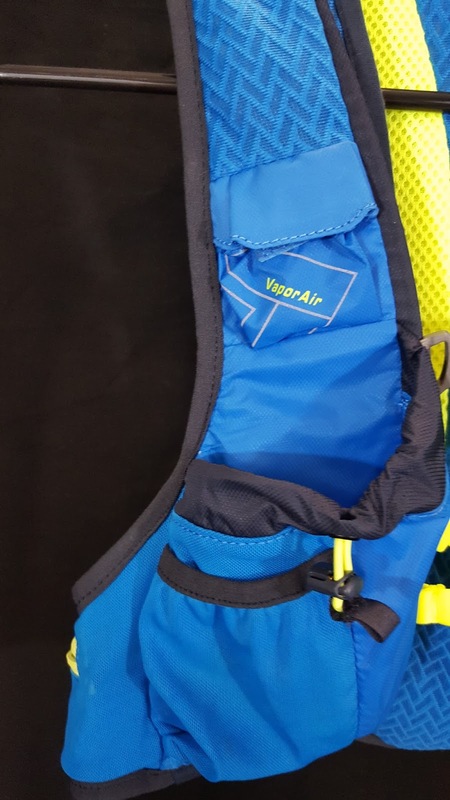 Nathan has been making quality running products for years, and the VaporAir has taken the best features of Nathan’s hydration packs and put them all in one great product. Way to go Nathan! 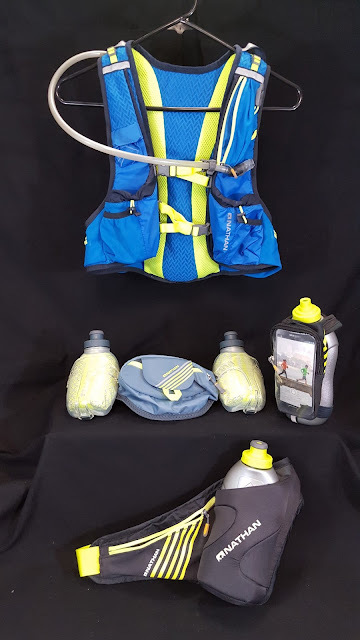 I am very pleased with this hydration pack and the rest of the hydration products I tested from Nathan. I think you will be too. Nathan states that “No matter how hard you push our gear, we guarantee it.” This does not include normal wear and tear, but you are covered from any manufacture defects for as long as you own the product. That sounds great to me. I definitely push my gear to the limits at times and it is great to have a company that stands behind their products. I emailed Nathan a while back about a leaky bottle and they shipped one out to me at no charge, no questions asked. Now that’s great service!